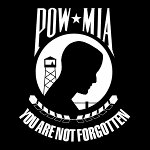 National POW/MIA Recognition Day is an observance that honors whose who were prisoners of war (POW) as well as those who are still missing in action (MIA). It is observed in the United States on the third Friday in September. National POW/MIA Recognition Day was proclaimed by the United States Congress in 1998. It is one of the six national observances when the POW/MIA Flag can be flown. The other five observances are Armed Forces Day, Memorial Day, Flag Day, Independence Day, and Veterans Day. The POW/MIA flag was created by the National League of Families in 1972 and was officially recognized by the Congress in 1990. It is a symbol of concern about United States military personnel taken as POW or listed as MIA. The POW/MIA flag should be no larger than the United States flag. It is typically flown immediately below or adjacent to the national flag as second in the order of precedence. On National POW/MIA Recognition Day, the flag is flown on the grounds of major military installations, veterans memorials, government agencies, federal national cemeteries. In the armed forces, a single table and chair draped with the POW/MIA flag are displayed in mess halls and dining halls. Such installation symbolizes the hope for the return of these who are missing in action.